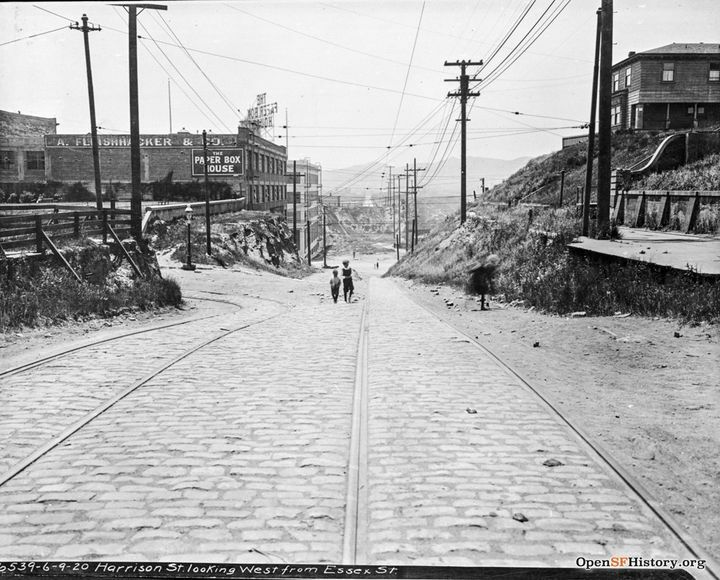 Harrison Street in the 19th century was an industrial neighborhood from one end to the other. 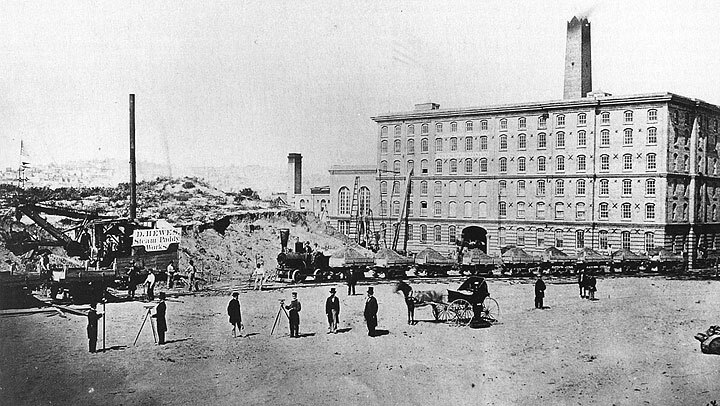 One of the first factories was San Francisco's earliest sugar refinery built by George Gordon (also founder of South Park). 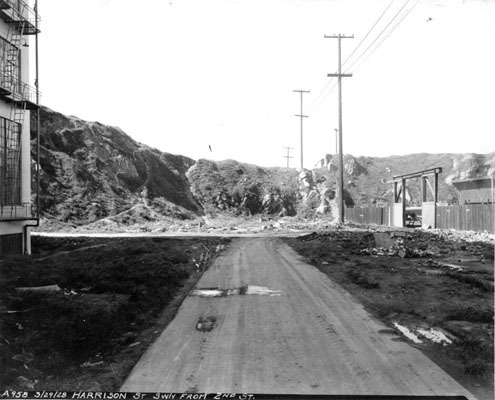 The "Hewes Steam Paddy Works" at left side of photo shows how the sand dunes that once dominated the South of Market were leveled, filling in the once ubiquitous fresh water ponds. 'Paddy' refers derogatorily to the Irish laborers who were replaced by the steam shovel. The building is Gordon's Sugar Works at 8th and Harrison. 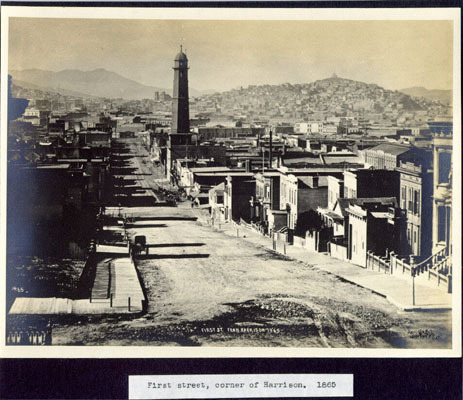 Looking north on First from Harrison atop Rincon Hill, 1865. Selby shot tower, where they made artillery shells (cannon balls) is at 1st and Howard Street. Old St. Mary's is visible on slopes of Nob Hill in distance, and Mt. Tam is in the distance. 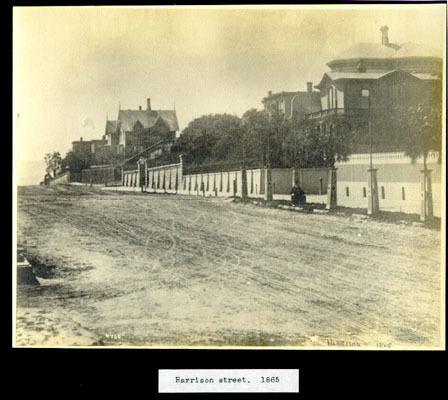 Harrison Street on Rincon Hill was lined with mansions in 1865. After the Second Street Cut went through a couple of years later, this area quickly sank economically when the wealthy moved to Nob Hill and elsewhere. Harrison Street looking east at 3rd, Oct. 20, 1916. 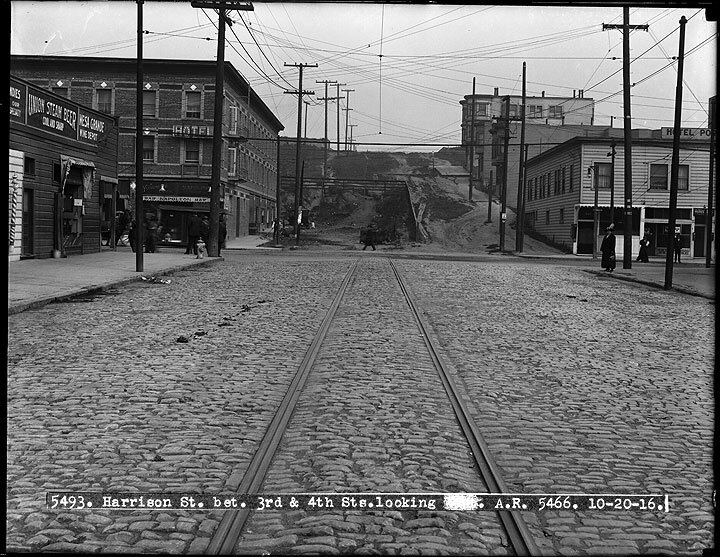 As late as 1928, Harrison didn't run through from the lower 2nd Street. This photo is looking west from 2nd on Harrison. Westerly view on Harrison Street from Essex, c. 1920s. 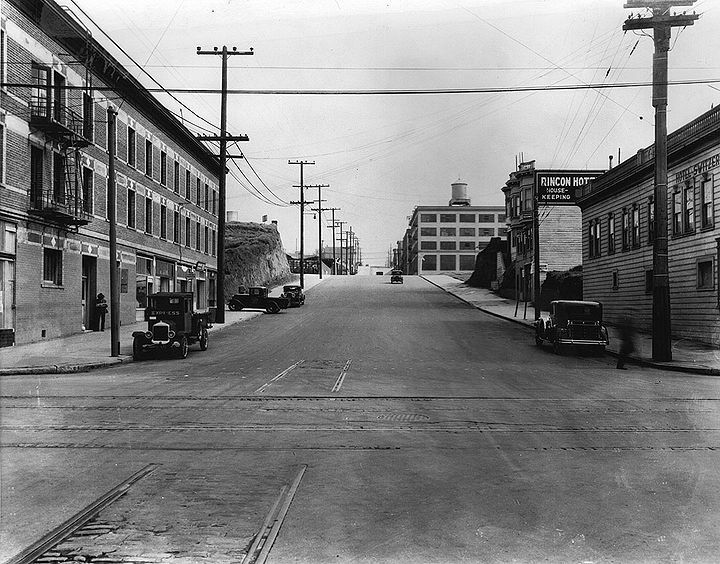 Harrison Street easterly at 3rd, looking towards Rincon Hill on March 28, 1933. Harrison at 8th Street in 1946. 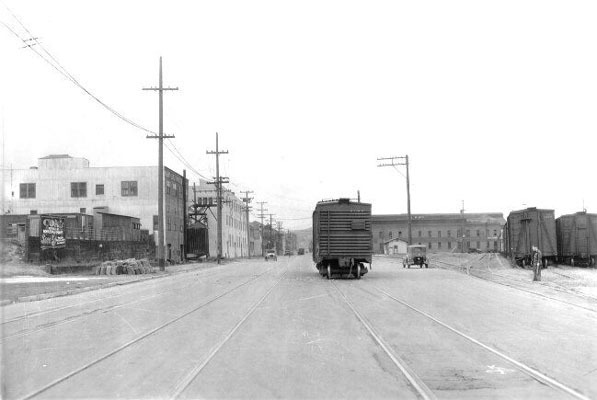 The old sugar works is long gone, and this area is part of a continuous industrial zone from about 3rd all the way into the Mission District, serviced by freight trains until the 1990s when the tracks were finally removed.